This 20-hour online course is designed for teachers seeking an additional qualification in teaching preparation for the International English Language Testing System (IELTS). Instructors will learn about the structure of the General Training and Academic tests and explore methodologies, strategies, tips, techniques, and resources for teaching or tutoring IELTS preparation. The course is divided into 4 modules and each module has an online test at the end. 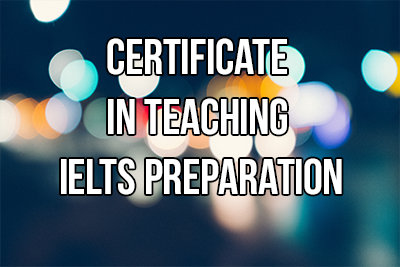 The modules include: an Introduction to the IELTS and other language proficiency tests, IELTS Language Skills, the General and Academic tests, and Lesson Development for teaching IELTS preparation.